This is what I went through to get my Radion to connect to my ReefLink. I recently moved into a new home and I have a temporary frag aquarium. 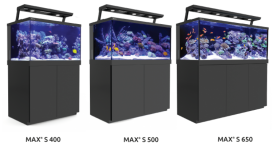 I've had a few issues with algae and wanted to reduce the intensity of the aquarium lights. I needed to tweak the configuration of the lights or set them to acclimation mode for a few weeks. I ran into many problems trying to do this and I hope this information will help someone else through the process. I needed to link my Radion to my ReefLink which I had not set up yet. I had to reset my ReefLink because I had a new wireless network with a different SSID. I powered it up and pressed the reset button on the back of the unit, once the light turned white it was done. I downloaded the ReefLink Setup app from EcoSmartLive.com and installed it. First, I unplugged the power cable from my ReefLink and plugged in the USB cable. Then I plugged it into my computer and set up my wireless. From the EcoSmartLive website, I searched for wireless devices, and the ReefLink did not find it. I then tried to add a device via USB by plugging in a USB cable, but the search did not find anything, or I would get a screen claiming that it was looking for a device and never returned anything, just kept looking. I unplugged my Radion and left it unplugged for about 30 min and tried again with no luck. If your computer does not detect the ReefLink, you probably need a different USB cable. Many USB cables are intended for power only usage and do not transfer data. It turns out that the USB cables I was plugging into my computer and the Radion where power only and did not transfer data. If you need a data USB cable you can pick one up on Amazon, click here. 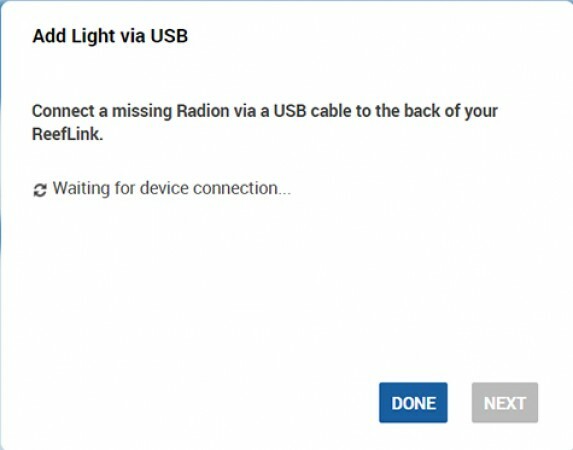 Eventually, I found a USB cable that could see my Radion, I downloaded the connection manager and connected my computer to the Radion via the USB cable. I thought this was going to solve all of my issues. I used the cable to connect the ReefLink and the Radion, then I tried to add a USB Light. No luck, so I restarted my Radions and tried again. Once again no luck. 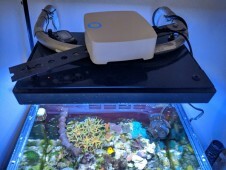 I contacted EcoTech Marine for support. I explained what I had done and they were not happy that I had installed the Connection Manager and had plugged the Radion into my computer. I'm not sure why they were not happy. Before the ReefLink existed, I would use an app on my computer to configure my Radion's. This app seems to have disappeared. I assumed it was the connection manager but I do not see an option to set the light schedule or to import and export a schedule. Uninstall the Connection Manager application from my computer and reboot the computer. On the drop-down, select Format SD, once the light turns white, it's done. Search for Wireless devices, if it does not find it then connect the Radions directly to the ReefLink via the USB cable and then search for USB devices. I did all of this and still did not have any luck. I spoke with EcoTech Marine support and they claimed it was the USB cable. I didn't agree, the cable did not seem to be the problem, I could see the Radion when it was connected to my computer. I reinstalled the Connection Manager and connected the Radions to my computer. Through the connection manager, I disabled the buttons on my Radions and then checked to see if it worked, and it did. I enabled the buttons, so I was able to communicate with the Radion from my computer to the Radion using the Connection Manager. I did the steps above several times just in a different order only instead of uninstalling the connection manager I just killed the app from running in the background. I was debating my sanity by doing the same steps over and over expecting different results to the point of giving up. At this point, I figured the only real option was to do a factory reset on my Radion, which was an option in the connection manager. I was so frustrated that I went ahead and did the factory reset. My Radion turned back on after the factory reset at 100% intensity and the fans kicked on at 100% too. You may want to clean your fans before you do this or cover your tank. I was not expecting it and a lot of dust was blown into the tank. That was the least of my concerns, I was more concerned about the light schedule. I had no idea what the schedule was for my lights and they were set at 100% intensity with no way to change it. I tried everything listed above again to see if the factory reset fixed it. Unfortunately, at midnight my lights were still on 100% intensity. I had no other choice but to unplug the Radion overnight. I was hoping that leaving the Radion unplugged overnight would resolve the issue. In the morning, I plugged them back in and jumped on EcoSmartLive and searched for the Radions. It didn't work. I grabbed every USB to Micro USB cable that I could find in the house. I started plugging them into my PC and the Radions. If my PC could see the Radions I put the cable in one pile, if it could not see the Radions then I placed it in a different pile. I had five cables that were able to see the Radions, so I plugged each one into the Radion and then into the ReefLink. Eventually, one of them saw the Radions. Awesome! The ReefLink performed a firmware update on the Radion, and it possibly reset the Radion to factory settings again. 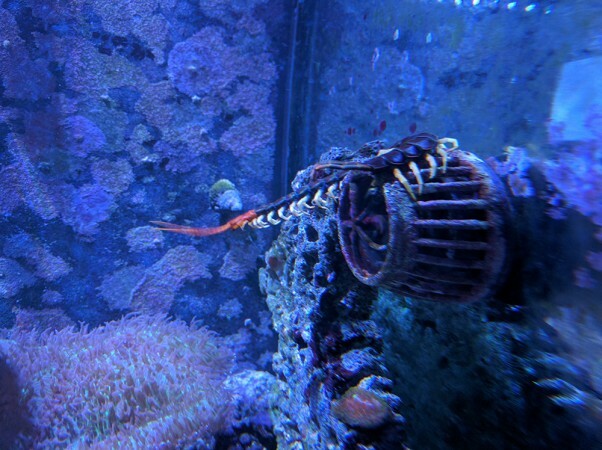 When it added the Radion for some reason it deleted my aquarium profile on EcoSmartLive. I unplugged the Radion from the ReefLink and rebuilt my light profile. Once I was done, I tried to push the changes to the Radion, and I just got a spinning wheel. The changes never made it to the Radion, after a long time I gave up and refreshed the page. I look under devices, and my Radion shows offline... UGH. I searched for wireless devices and it wasn't found. I rebooted the Radion and searched again, no luck. I then plugged the Radion back into the ReefLink. Refreshed the devices and it was online again. I unplugged it and then refreshed the devices, and it was offline again. At this point, my number one goal is to get the light schedule back on the Radions so my corals did not die. I plugged the Radion back into the ReefLink and refreshed the devices, and it showed up again. While still plugged in, I tried to push my light config to the Radion, and it was successful. Very successful, to the point that after I pushed the config, I unplugged the Radion and the ReefLink and the Radion still showed online. I tried to change the config and play with some of the demo options on my phone to make sure it was responding, and it was. SUCCESS! Honestly, I wish I would have thought to have changed the SSID on my new network to the same SSID which I had before, and then I could have possibly avoided this entire mess. If you are struggling to connect your Radion to your ReefLink, I hope this may have helped you.